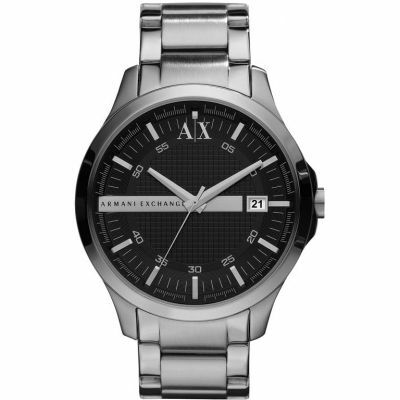 Subtle mens Armani Exchange watch, with stylish stealth black Ion-plated steel case and bracelet. This sleek design has a black dial with black baton hour markers and detailing for maximum style. Inside the watch is a Japanese Quartz movement, featuring a date function at 3 o'clock. 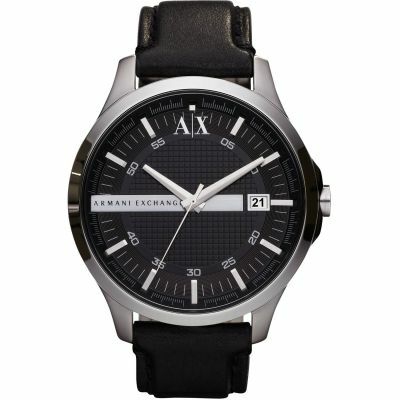 The dial also features the Armani Exchange logo at 12 o'clock for an added effect. It fastens with a push-button deployment on the black metal bracelet. Lovely watch, good quality, can't get over how cheap it was.. Can't wait to give this to my partner for his birthday, he's going to love it! Great service throughout, and quick delivery. Thank you! Watch was exactly like the photos, came gift wrapped and looked wonderful, really happy with the style/colour. Amazing looking watch, brought for my partner for our anniversary and he loves it. Only had to remove two links. Easy to set time and date. Great watch with lovely detail on the face. Large face and excellent present for and age range. Would definitely recommend this watch, very cheap and amazing quality! Packaging was great and just an overall great present! Pictures online don’t do it justice. Black shiny strap with the AX logo on the face and strap. The watch is a nice accessory to wear to formal events and day to day. The quality is top notch and Id definitely recommend. 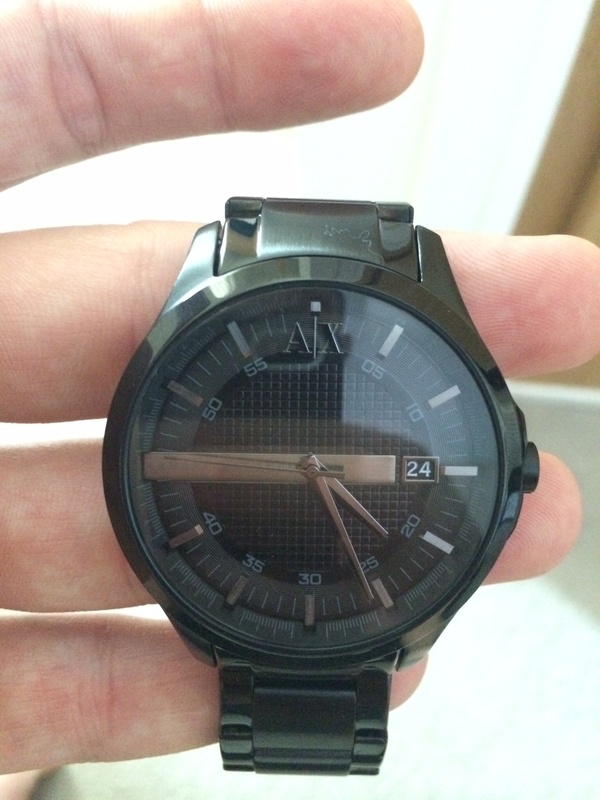 The watch has a decent black colour and design is great. It has great price, great material. no complaints. came with certificate original boxing. if any thing every happens to this watch I will re buy it. thats how good it is. The delivery was exceptionally fast- I ordered in the evening and it arrived the following morning. All free of charge! My partner loved the watch and the quality is amazing. My only critique is that the gift wrap had watchshop printed on the inside of the wrap. So it kind of spoiled the suprise! Beautiful watch! Looks lovely & the big watch face is a great point! Bought for holiday but will definitely wear all year round! the product itself is awesome I like the colour and shape of the watch and its perfect size around my wrist .thers nothing about the watch i dont like about the watch it was what I was looking for. Bought as a 21st birthday present. Looks very good. Quite heavy. Good value. Will need adjusting to fit but came with a money off voucher. The design of the watch was perfectly fit and tailored to suit any young trendy mans wrist. 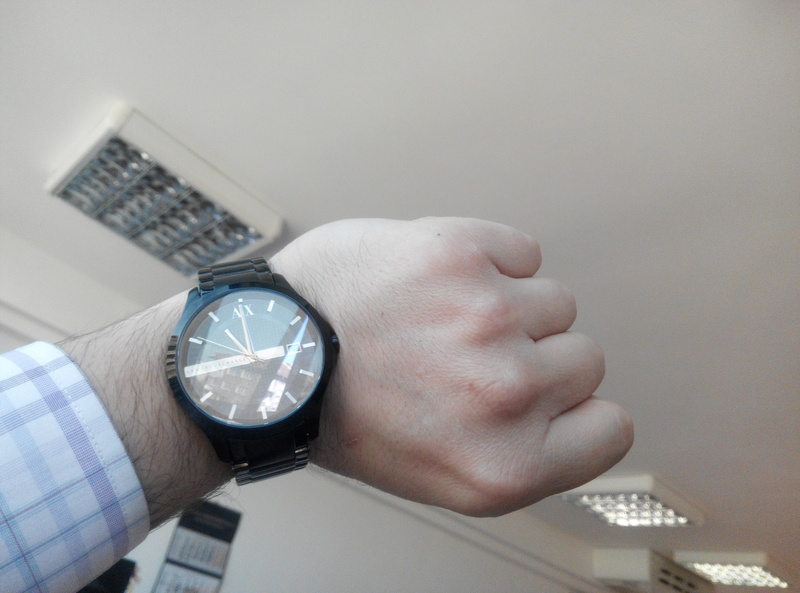 The black matte of the watch ensured that it could go with any type of outifit, smart or casual. It is a classic , slick watch which would be recommended highly to people that I know. I bought this watch for my partner who is fussy on watches and wanted an all black watch. I looked everywhere but could not find one. When I came onto the watch shop I saw the AX2104 and thought perfect, it looked smart and sleek on the picture and was basically a perfect match. I bought this easily through the site. When it came I opened it straight away to check it looked as good in real life than to what it did in the picture - and it did.. it was gorgeous. I could not wait to be able to give this gifr to my partner. 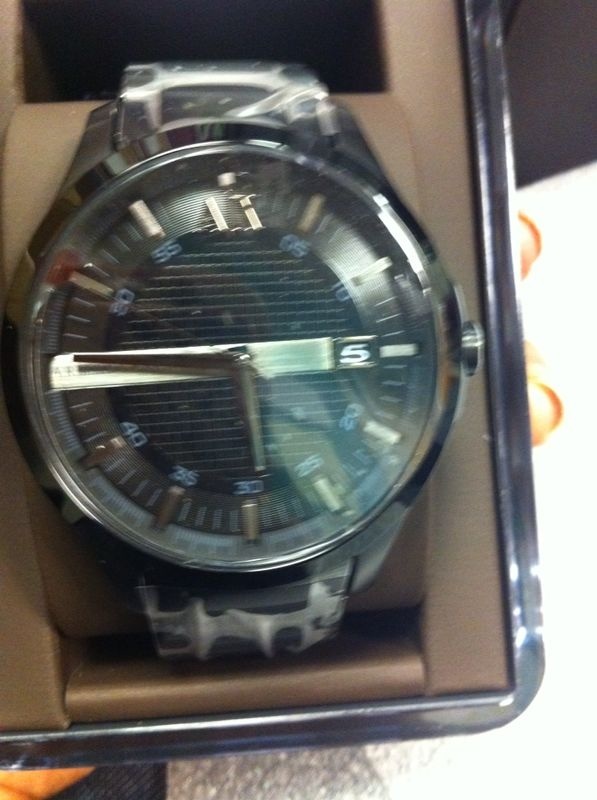 The price was a good price for a watch, I wasnt sure how much to spend but went on taste rather than price. \r\nIt also has a day clock so tells you what date it is.. always handy. \r\nWhen giving it to my partner on Christmas day he loves it.. he onlywants to wear it on special occasions but so far since Christmas day we must have had a special occasion everyday as it hasnt come off his wrist yet!! Purchased this watch for my son for Christmas, he was made up with it!! It looks better in real life than on the website, looks more expensive than it actually was, would recommend this watch, excellent value for money. I purchased this watch for my fiancés Christmas. Hes well chuffed and looks beautiful on!! I would recommend this watch to Anyone. Looks exactly like the photo if not nicer. Size was perfect although I think they should give dimensions of the watch face as its always hard to tell on photos. Very nice watch. Accurate description. 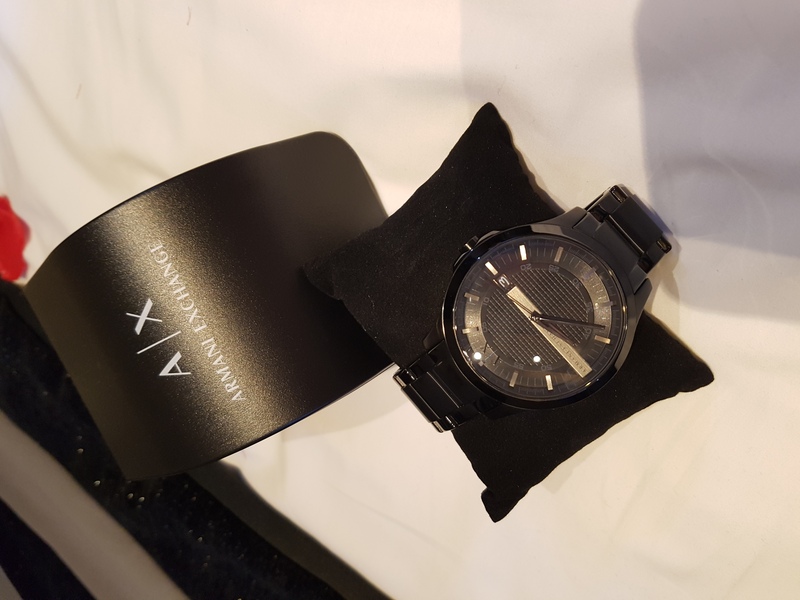 I bought an Armani watch for my son the style is very modern and sleek.the bracelet needed amending as was explained on the Watch Shop website. which gave me the option to send measurements of his wrist off or take it to Glodsmiths to get it fitted the design of the watch itself just screams expensive and quality so much so that I am in the process of ordering a ladies one for my daughter !! Fast service, very good prices, delighted with my purchase. Hope its new owner is as pleased. Fab watch!! Excellent product! 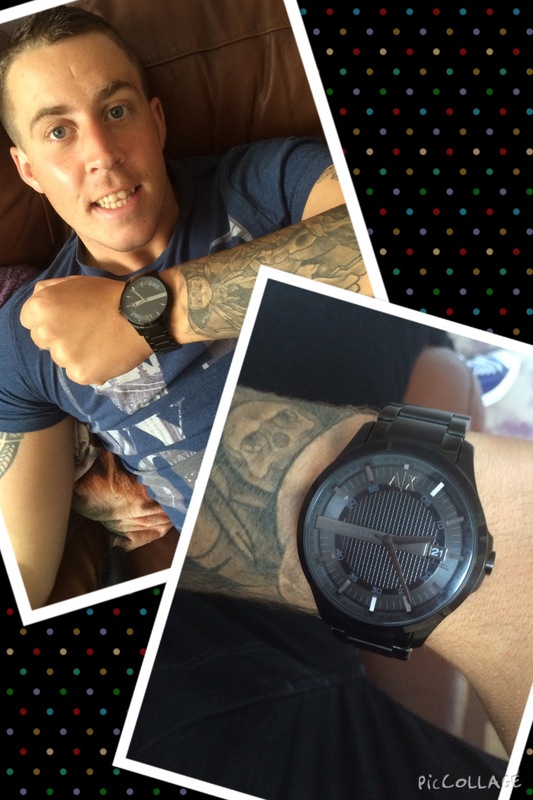 The watch itself is beautiful and has lovely attention to detail, one very happy son who now looks super cool too! Great company and excellent delivery service. The watch was wrapped well and came in a lovely designer box would definitely use this company again.well done on excellent service! Beautiful, yet simple watch. Masculine but not too heavy or large. I was very impressed with the choice and speed of delivery, will use this site again. Watch looks great not used yet as its for my son for xmas. Arrived quickly and safely via the courier. Price was amazing £50 cheaper than a high street jewellers. I purchased this for my boyfriend for his birthday, he loved it and he loved the packaging also. I found the delivery methods very useful and I am 100% satisfied with my purchase and will be ordering from watch shop again! Thank you!! Stunning watch. Cant wait to give it to my prtner for hus Christmas! Its a Christmas present for my 16 year old son, I hope he likes it. Amazing, great present and looks very smart! Perfect gift, amazing quality - the item is ideal for a statement piece to finish any look. More over because this is a matte black watch makes the look on a guy look good. Definitely quality worth the price!! Lovely watch bought for my 18 year old son xmas. Very stylish smart watch. Really fast delivery, & great getting 10% off orginal price too. Lovely watch and looks brilliant in real life also, would definitely recommend for a gift or for yourself. Excellent watch, looks exactly like the image. Customer service at the pick up location was great and the watch shop kept me updated all around the clock. 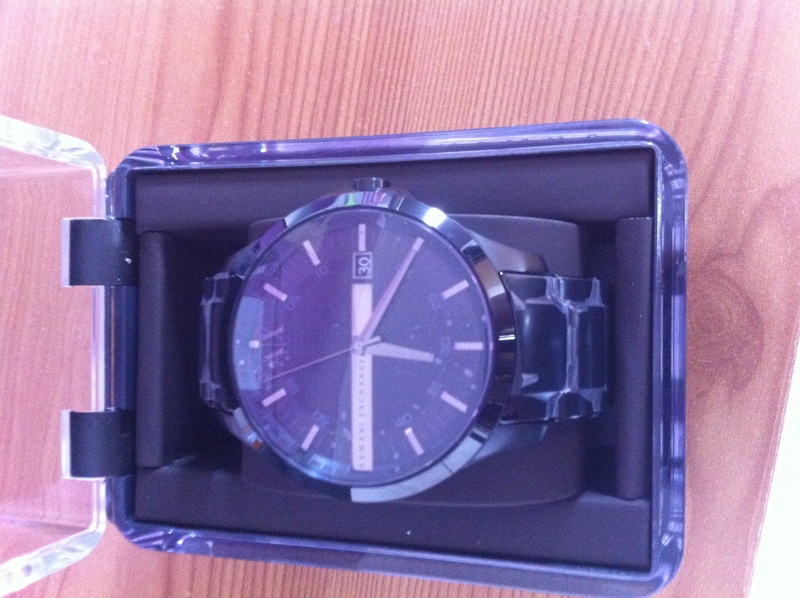 I bought this watch as a present for Christmas and was very happy when I recieved it, fast service and delivery. Brilliant , straight forward orderings , collection and good advice on collection by helpful staff . Really pleased with item just as advertised , good after service given .Would definitely use service again and advise my family and friends . 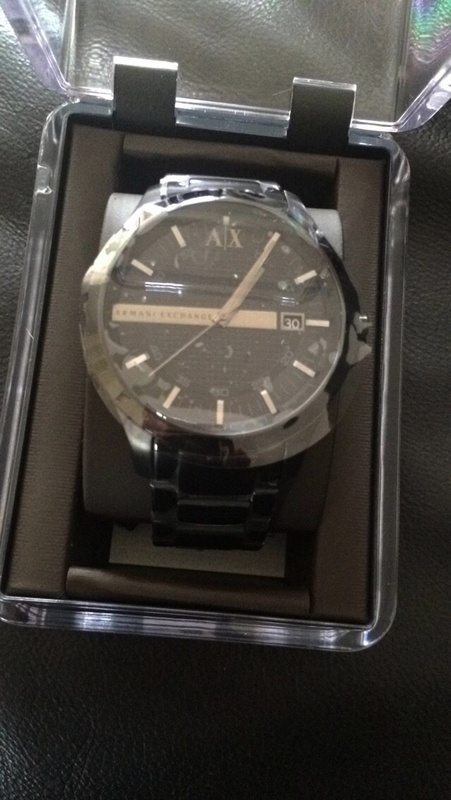 Really lovey watch my sons brought it for there dad for Christmas he will love it very stylish and reasonable price . When it comes to watches, my boyfriend is very, very fussy. So when he pointed out this watch to me, almost straight away, I knew I had to get it. The style of the watch was the first thing that caught my eye. The all black, makes it look very smart, and can be worn with pretty much anything. I really like that the face of the watch, is just big enough, to size nicely on your wrist. In all honestly, as soon as I got the watch, I realised there isnt anything not to like. Its exactly what I wanted, and I am very pleased with my purchased. Just a little note. The watch is slightly shinier, in person, than it is in the picture. The shine of the watch, doesnt bother me, and I think, only adds to how much I like this watch. Every single bit of the watch fits the description of what my boyfriend wanted. The face that wasnt too big, or too small, and sat nicely on his wrist. A metal, links strap, that has a slight two-tone look about it. The all black finish, which was the thing that drew me most to this particular watch. Overall, I am so happy that I purchased this watch. I, honestly, cant fault it. Its definitely going to be a very memorable gift! Lovely watch, looks far more expensive than it is. A nice everyday watch. I brought this stunning watch for my partner and I must say the pictures dont do it justice. Its stylish and sleek look is just perfect...: the only down side is the rather cheap cardboard box it comes in and basic looking plastic case I feel the packaging lets it down however lets face it it aint the packaging the person will be wearing so overall its a 9 out of 10 from me. Great watch! Subtle and not too flashy. Received my item beautifully wrapped and on time. Excellent service. Really loved this watch when it arrived, looks much better in person. Its a gift so I hope my son will love it too. Cant review as its a christmas present for another person. Has a really nice weight to it. Extremely happy, watch looks even better in person than it does online! My husband is going to be very happy this Christmas!! Beautiful watch my fiance is going to love it! Its smart and black and will look excellent for his posh do he has to go to. Beautiful watch, so classy and clean look. Perfect for my partner and I would have 100% paid more for this watch! The watch was just what I ordered. It came on time in perfect condition and my boyfriend loves it! Bought this watch for my boyfriend as a gift. Its so stylish and Im in love with it. The colour is perfect! Love that its all black as it looks good with everything. Definitely worth the price! Looks even better in person. Beautiful watch - even nicer than expected! Super fast delivery and such an easy process even with a few bonus thrown in such as discounted watch alterations with order! Would highly recommend the watch shop and especially this watch! The watch looks better in real life than in pictures. Whilst the watch is dark, it catches the light well. Bought as a gift for Christmas so unsure of how well the fit is. Nice watch. Came perfectly presented in box. Easy to change links in order to make the wrist strap bigger or smaller. I absolutely loved the watch! It looks very expensive, a lovely size, colour and design and was so pleased the watch shop had it on sale! I had a minor issue regarding being sent a broken box but this was quickly resolved and a new box was sent out to me within a couple of days! So satisfied with my purchase and with the service I received overall. Will definitely purchase from the watch shop again. i wasnt actually looking for a watch until i saw one in the town and i almost bought it there and then and then i remembered the ad on tv and walked out the store and checked online and low and behold there was the same watch for around 25% cheaper. This watch was better than I could imagine! Bought for my partner who LOVES it. Its comfortable and classy. So many people have commented on it. A couple have actually bought it as a result! Just perfect! The watch is a gift and Im really very happy with how it looks. It actually looks bigger than what the image shows but Im pleased with that as I was looking for a particularly large watch purely because I like the aesthetic. Very happy with the service too. Watch has a slightly bigger face than shown on the images, although it isnt nescessarily a bad thing. The strap is caeramic on the outside edges which also isnt stated but again I think works in the watches favour anyway. Overall a very nice, good quality watch. Perfect for everyday use or that nice occasion! Wonderful service. Would purchase again. Watch for 21st birthday prezzie. Loved it. Highly recommended. Great, very prompt service. I ordered online late Sunday night & received this watch early Tuesday morning, with the strap adjusted to the size I had requested. Excellent watched! The slick all black look is just want I wanted. Perfect gift for my boyfriends birthday. 1st class service and knew at anyone time where my order was. Really good look, quality was on point. Fit appears to be great too. I really appreciate the packaging of it aswell it really adds a personal touch to the gift. Incredibly classy. Thanks watchshop! Elegant looking. Look is worth more than the price. Fast delivery as well. Please with the sale. Bought this watch for my husband, he absolutely loved it! Hes 26 yr old so its perfect for him, not too boy-ish or too elderly - just perfectly in between. I personally love the dial size and would recommend to anyone who loves slightly larger dials. It is so classy and looks amazing with any attire worn. Highly recommended! Excellent purchase, I am very pleased with the look of the watch. 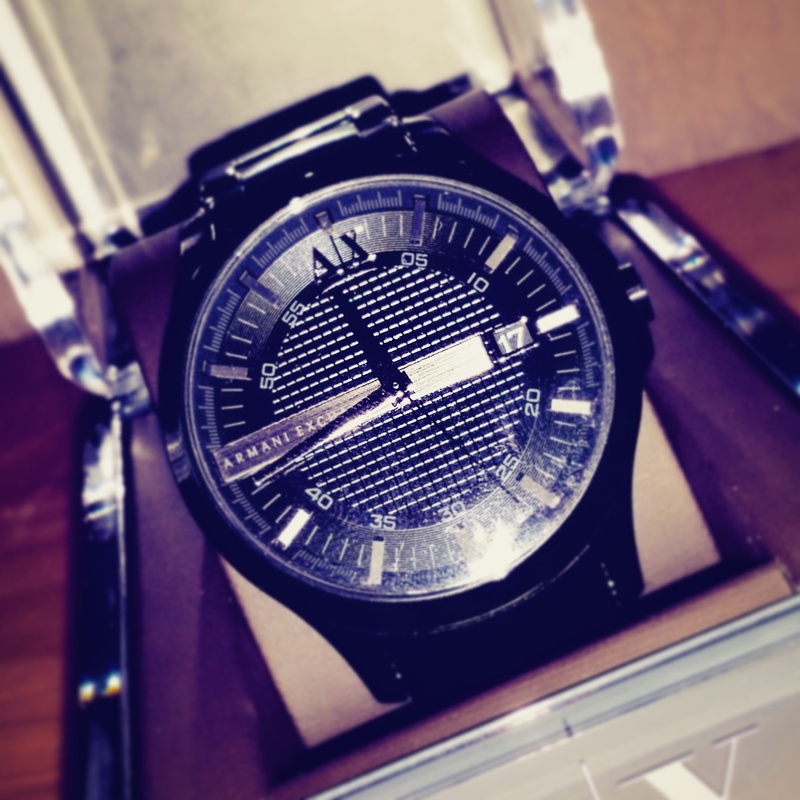 I brought this as a 10 year anniversary present for my husband, he doesnt not normally wear watches, so when he decided he would like one he had no idea as to what he was looking for, just a black watch!? 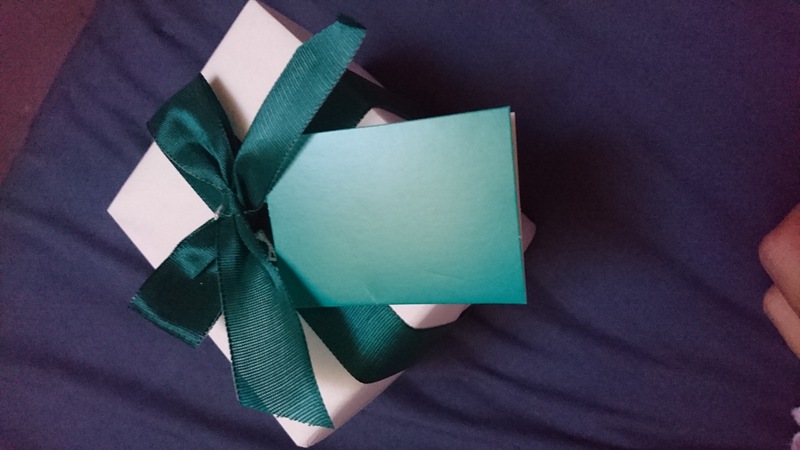 So with just this to go on I was extremely happy I found The Watch Shop, their website was so easy to use and I found the perfect watch, i used the additional option to have the watch gift wrapped and added a personalised message which went down a treat. He loves the watch, phew! We have also used the free resizing option offered through Goldsmiths and had no issues in doing so. 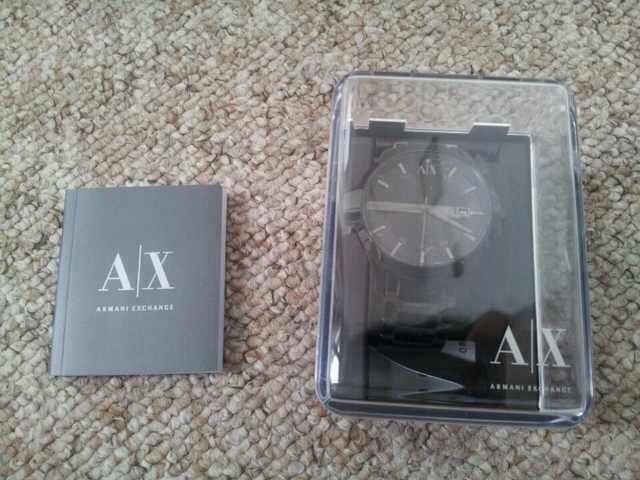 Im so pleased with the whole process, I would highly recommend The Watch Shop and the Gorgeous Armani watch purchased. Came on time and in perfect condition. My son was really pleased with his birthday present. Watch looks really good! Love everything about it and looks nice with most clothes! Delivery was spot on, nicely gift wrapped. Couldnt fault it!! Excellent service, very pleased with item. Very pleased with this. It is a surprise present for my husband for our wedding anniversary. I had a few links taken out and was very happy when I was told how well made it was! I cant wait to give it to my husband, I know hes going to love it. Watch shop are reliable and professional in dealing with customers. Watch came in a nice presentation box and was as advertised. It was a present and the recipient liked it. Very nice watch well pleased. The watch came on time and looks great. Very happy with this purchase. Perfect Fathers Day gift. Lovely watch. My husband has large wrists and it just fits. If you have an extra large wrist you may want to think about getting a link added. Bought this watch about three and a half weeks ago, I enjoy wearing it and love seeing when all the people look at it and think how perfectly made this watch is. 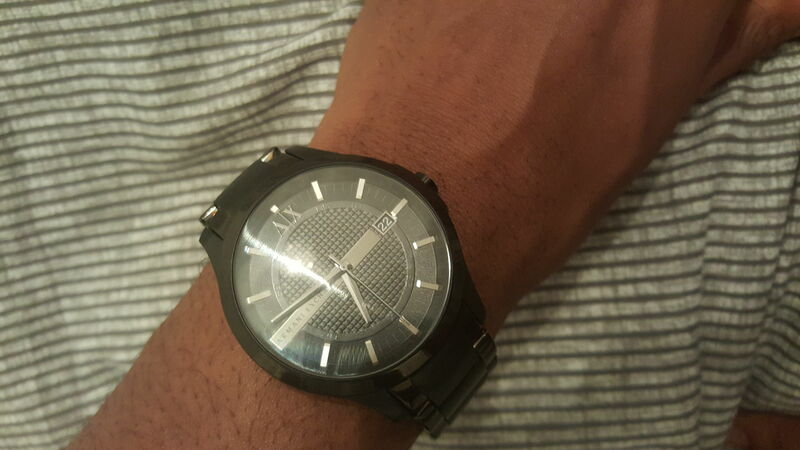 I had about 4 links taken out because of my skinny arms and I thought the watch would look too big, but look if you are just as skinny as me theres nothing to worry about, it would look excellent on your wrist with no doubt. The outside of the actual watch screen is metal and if that scratches you can easliy get rid of it so dont you worry about it. The delivery time was fantastic because it got delivered the next day just as it was said on the website. I will provide a couple of photos of the watch, Im literally in love with it, the best watch I have bought at the price of £135. Bought as a gift, excellent condition of a watch, stunning on! Nice large face and beautiful colouring on the strap! Would recommend to anyone!! I received very good service from the watch shop, my order came nicer than I expected. Very quick and I was very impressed.Would definitely recommend and use again. The watch was bigger than intended however it was a bonus in my opinion, Also the customer service I received was exceptional. Im very happy with the product. Bought this for my sons 18th and he absolutely loves it. A nice heavy, stylish watch. Great value and reasonable price. had this watch as a gift am very pleased with it as it is stylish looks good on me and so far keeps good time . Gorgeous watch. Very happy recipient. The watch looks brilliant it was a 50th present for my Dad and he absolutely loves it! The watch came on time, i ordered it to my boyfriends workplace and he loved the watch! Came quickly and efficiently. Nice watch. Exactly as described. 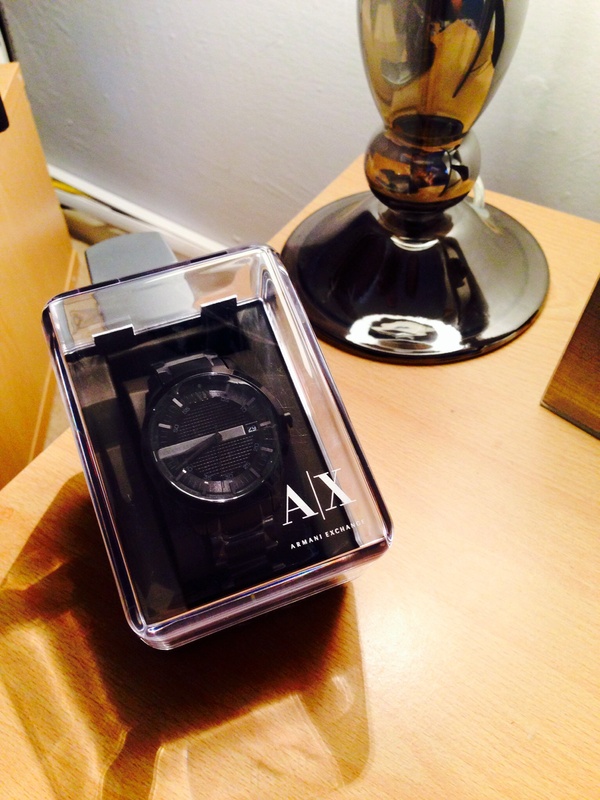 Amazing value - exceptionally good looking watch which arrived on time excuse pun and in attractive packaging. This watch is a nice buy, great finish and just my colour. Great value for money. Bought for a gift for husband. Good quality. Fast delivery. Husband loved his present. Watch shop are a brilliant company, I received my watch the date they advised I would receive it. the website is a good, easy and simple website to use. no struggling to order like some websites.\r\nThe watch is just beautiful. i went and got the watch resized with few links taken out. the watch head is big and bold and easy to tell the time on it. its all black and the links are a shiny black. Brilliant watch. very very happy with it. This item is just as the picture, All Black and had amazing detail, the face of the watch is big but not too big on the watch and the strap gives that added detail with every other link being a matt shine. This was a perfect gift and was loved. Love the watch, great quality and value for money. Was posted out very quick and love the fact you get points from buying! Great watch, came next day as promised and watch looks great on! I love this watch and received many compliments as a result of its purchase, it looks fantastic and is the sleek, dark accessory i was looking for. It has a good weight to it and is is highly resistant to scratches and marks on the whole piece, i cant find a fault with it as the strap is also very good quality and it fits perfectly. One minor setback that i did find, was that it isnt portrayed entirely accurately on the website picture as the details in the watches face appear more sliver in colour than shown. This may be a problem for some buyers, however other photos and videos of it show accurately. Overall i am extremely happy with this purchase and would suggest to all looking for a sophisticated and amazing looking watch. Watch is everything I expected, very good quality, and looks great. Only problem was the size as I ordered it online, I had to go to a jewelers to get it resized but all is fine now. Very good looking watch, amazing value for money. Well worth it. So happy with my purchase, this is my first ever watch and love the detailing, from the chrome hands to the date window and the Armarni Exchange branding on the crown and on the chrome back of the watch. 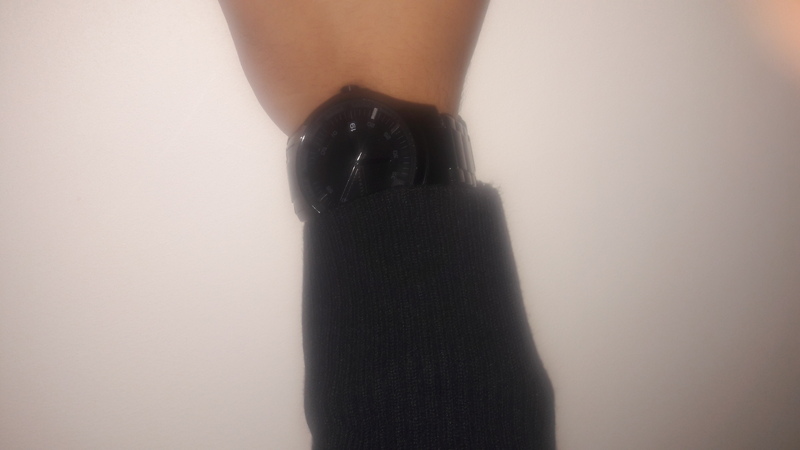 The black colour of the watch means its perfect for any occasion, fits perfectly, fast delivery very easy to order, will definitely be using watchshop again for my next watch, the discounts they offer and huge selection of watches they have makes it really hard just to pick one watch, thanks watchshop for my perfect watch. Awesome service, love the free adjustment option but the fact that they refund you money if you get it done elsewhere is amazing. Product came next day I cannot fault the service. Will definitely be purchasing from here for all future watches. Excellent product at very competitive price. Super fast delivery. Ace site to deal with. Watch looked exactly like it did on the website! Would be better if the photo reflected the light on the strap a bit better, so we could get a better idea on the finish. The watch is a sleek and smart design. It is subtle in detail which is why I like it so much! The person i bought it for loved it as well thank god! The watch was very nice, looked classy with the black face/strap. I bought this for my husband and he was very pleased with it. Fantastic watch. Looks perfect whilst wearing and will fit with anything you wear. My watch arrived on time and looks beautiful really pleased with it. good watch,but only thing is the hands and dials are not black but grey. Cant tell the size on the photo as thought it was going to be smaller but very happy with this watch and so pleased with the purchase!! Definitely recommend this. Bought this watch for my son. He loves it! I chose it my self because I though it was different, I liked the overall colour. He loves the colour and style... he says its different to his other watches so I got something wright. Great watch, great price, stylish. Great looking watch - classy appearance in black. This was bought as a present for my son who has just started an apprenticeship. He definitely looks the part wearing this sophisticated timepiece in meetings. In fact Im rather jealous and would like one for myself! a great watch, for a great price, I would never go anywhere else! The watch is absolutely stunning! The all black colouring gives such a sophisticated and smart look, perfect for special occasions or for daily use. The watch face is large and easy to read as well as the casp being easy to use. 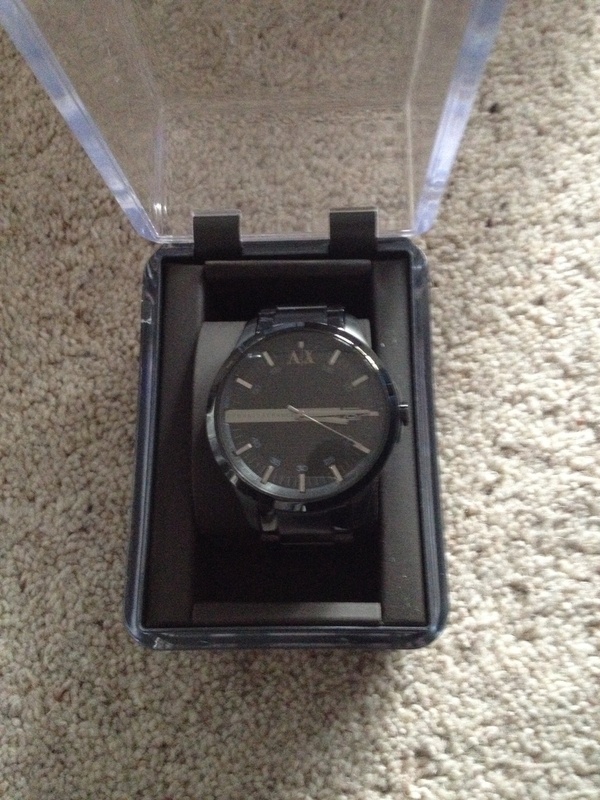 Additionally, the box that the watch is in is so sleek! I have bought this watch for my boyfriend for Christmas but I just want to keep it for myself! Definitely a brilliant purchase. I have worn this watch about 5 times in total and the colour has started to peel off, I can see the original colour of the watch of where it has been peeled. honestly, it looks really bad considering this is a fully black watch. I bought this as a Christmas gift for my husband. This watch is a black beauty! It has a beautiful finish overall, the face is classy with a stream lined look. Versatile as suitable for both office and semi-formal occasions. And the price is fantastic! The look is perfect but it needs to be worn to check its performance. Cant give a comment as the watch is still wrapped up and will be until Christmas Day. Fast delivery, efficient service & an excellent product. Very impressed with this watch it looks very sofisticated. Really nice watch...looks stunning on. Would recommend anyone to buy this product great value! Amazing watch, came the next day. And I was kept informed about the delivery. Bought this for my boyfriends 30th birthday- what a beautiful watch.blooks even better in real life. Simple, but stylish. A satisfying weight to it, just beautiful. Really quick delivery too!! Very impressed. Thanks watch shop, I will recommend you to anyone! A very good looking watch - a could not be beaten on price. My Grandson got this for his 21st birthday. He adores its black, modern, wicked look and thinks I am the coolest grandma for helping choose it. He especially loves the slinky black bracelet. I bet all his mates will want one just like it. It also does a fantastic job of telling the correct time! Bought this for my partner he absolute loved it! Looks very stylish on goes with anything, and a great price aswell, also love the box it comes in. Overall a great well priced product. great service. recieved in a couple of days . Its a lovely sleek watch..you can wear it casually or on a smart outfit. Looks exactly like the picture. Bought this watch as a present for my boyfriends birthday, and its safe to say he loved it! I was optimistic when ordering it, due to some reviews saying that it wasnt up to quality and that colours were off! However after seeing this item and it being the perfect colour all black, it is 100% a bargain! Cant fault the product or the fast service! Will definitely be using this site again! Early Christmas present for my 16 year old son. He loves it! Need to pay a visit to our local Goldsmiths to adjust the bracelet as its quite big as expected!. Fabulous looking watch. I bought this as a gift for my 25 year old son for his birthday. He loves the watch its very on trend . 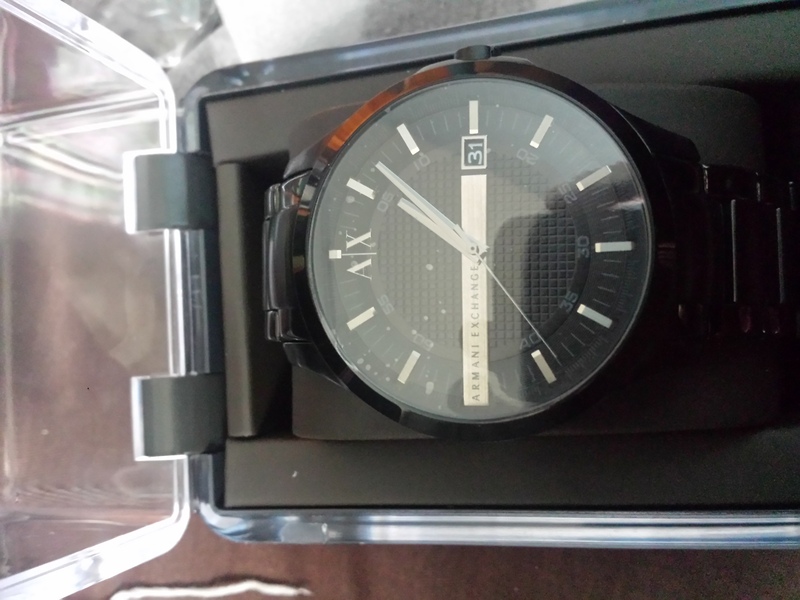 I bought this watch for my boyfriend as Armani exchange is his favourite brand for his birthday. I thought the watch looked even better in person and my boyfriend loved it. I would highly recommend it to anyone. The cheapest price I was able to find online amazing quality. Very happy. Nice elegant stylish watch. Brought as an anniversary gift for my partner. He loves it and has had plenty of compliments. Beautiful watch, great packaging and very quick delivery! Nice products, good prices and very quick delivery! I was very pleased with the watch. It was brillent. Delivery was excellent, and very well packed. I would buy from the Watch Shop at any time. THANK YOU. 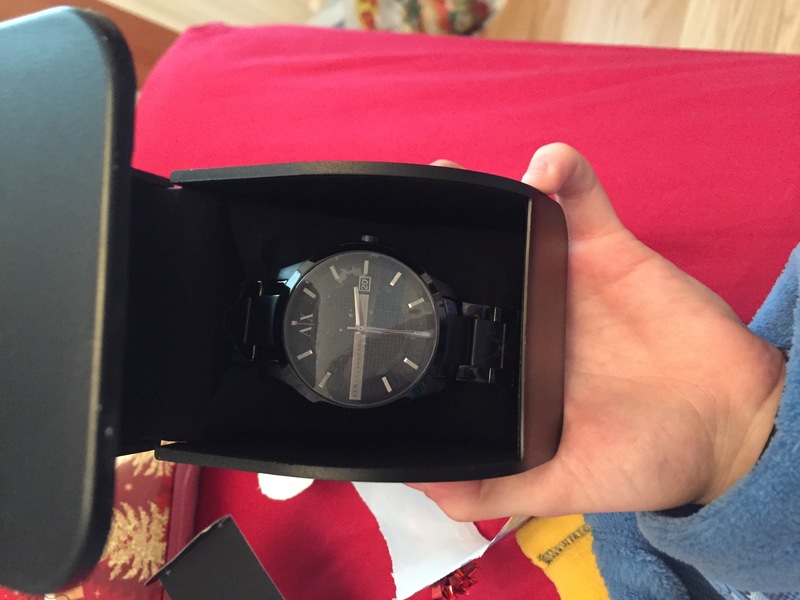 The watch is great I love it, looks amazing feels amazing and fits perfectly after I had two links out but overall its a great watch I bought it myself for my 18th and its my favourite present. Had lots of comments on how nice and smart it is so yeah its great. Also the delivery was really quick which was great! Very pleased with my purchase . Lovely Gift wrapping . 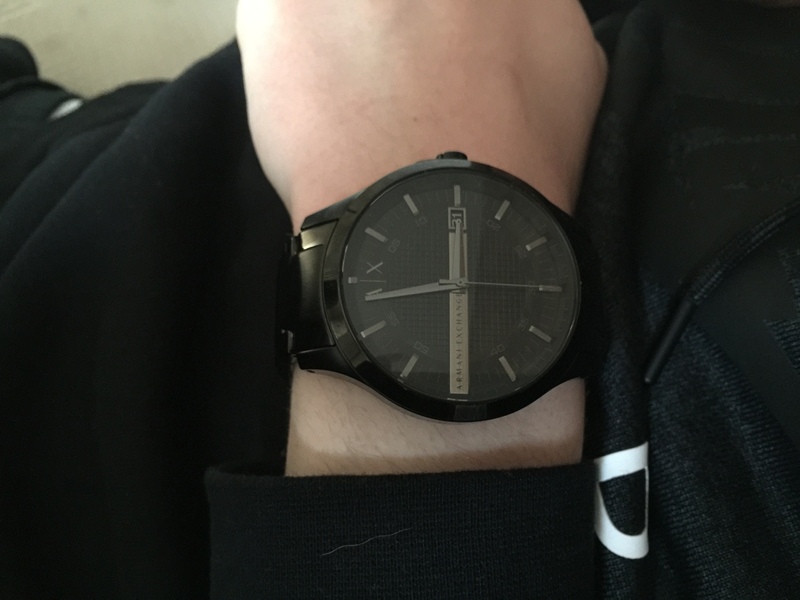 The watch was great, looks so good on my boyfriend and is really classy, delivery was great and fast. Very pleased with my order. Really pleased with my purchase. Stunning watch. Lovely watch, easy company to use. I brought this watch as a present for my nephew for passing his gcse exams. I was very impressed with the product as well as the prompt delivery. I got this watch as a gift for my husbands bday! And he absolutely love it!!! And I must say it is much better than it looks online. Its incredibly smart and the size and weight are great, I was a bit concerned as on the website it looked a little bit small, but its not all! Its a really good size watch with great quality and design, and it made a perfect gift for my loved one! The Watch is fantastic value for the money. Looks amazing. My son is very pleased with it. The service was excellent and really quick only bad point is that the glass protector on the watch had alot of bubbles in it. the order was completely how I wanted it. the watch turned out to be a lot better than I had expected and it also arrived on time. the gift packaging that I had asked for was beautiful and I would definitely order from here again! The watch looks great, slightly larger in the face than I was expecting but my other half wanted a big watch so he is delighted. The matte and shiny black breaks it up from being a solid look and the face looks really nice. A great buy. Excellent piece. Fully meet my demands. Quick delivery. Looking forward to next purchase. Great price, Great service and delivered next day, defiantly order my next watch from here again. The watch is very nice looking and very good quality, its very fashionable and looks smart but also great for casual use. the watch face is a great size, it is not too big or too small. Watch looks stylish. I bought it for my teenage son who has thin wrists the face of the watch is large but still looks amazing on his wrist. The watch feels heavy to hold but once wearing it is very comfortable. The central detail pattern is a classy feature. A good quality watch for a great price and a good delivery service. Will definitely recommend this site and will return again. all delivery information was regularly updated and emailed to me so I knew what time I would be receiving this watch. Lovely product, well made and perfect present for the other half who was more than pleased. The whole watch is black and makes a unique present that has grabbed attention from friends. We had the watch altered to fit better taking out a link and this was easy at the local jewellers as the watch is well made. Heavy and nice feel to it. EXCELLENT product and EXCELLENT service ever Watch Shop!! Unique experiance with this trader! Youve got a new costumer! The product I purchased was amazing, if you are looking for: a perfect fit which is easily changeable a smooth, comfortable feel a item which catches peoples eyes. This item is for you! This product is also the perfect gift, everyone will love it, I purchased this for my boyfriend and I couldnt have had a better reaction, he loved it. However this item isnt just for boyfriends, it can be for bestfriend, family, parents! The diversity of this item is just undesirable. I cant say one thing I dislike about this item, however I do adore the feature of the matt finish texture as it is so smooth and a comfortable fit!! Also the colour, if you are struggling to accessorise with all outfits, this is for you! It will save you so muxh money in the long run! As this watch goes with anything and everything. I cant express how much this item is useful! Its such a beautiful slick design which features major class. It helps boots confidence! I love this item and I would say it is the best product I have purchased! Its exactly what it says on the description! This watch is fab. Recently bought it for my husband, looks great, sleek and much more expensive than it is! Excellent watch, bought as a present for my boyfriend and he loves it. Colours and style are bold and looks really smart on. The watch is great, matchstick with the image and information as shown on the web. Very happy with it. Elegant looking watch with great bracelet fastening. Absolutely love the watch, cant fault it. Looks so nice and it is a relatively simple design which looks very good on the wrist. I do recommend this watch to anyone looking for a nice and relatively low priced watch! I bought this watch for myself. It arrived swiftly and i have been incredibly pleased. It is very high quality and has fantastic visual appeal. For the price it seems to be an absolute bargain and looks far more expensive than it actually was. I would recommend it to everyone. Stylish watch with clean and simple design for everyday use which definitely justifies its price. I was looking for such watch since I really don’t like those with overburden display providing chronometer, world time and etc. all options which I don’t use on a watch. However please be advised that the main picture of the item listed at watchshop is not quite accurate. Hands and dials are in fact gray to silver color. The above discrepancies mislead the buyer about the watch view which could be quite annoying for someone. Here is a picture in that respect. Lovely watch, needed adjusting but easily done at local jeweller, really please with purchase. Beautiful watch, bought for my boyfriend for his birthday just recently. It has as a lovely Matt look finish to it. Good General sizing as it seemed to fit, however you can take it to goldsmiths for free with your reciept to remove or add some of the links if it doesnt fit, so its a win win situation either way. The packaging was very nice and it was packaged secure enough. However, the watch does look all black on the picture but in person some elements in the watch face like the Armani writing is on a silvery looking piece rather than black. Never the less it looks just as nice, would highly recommend as a present as its not too expensive like a lot of others ive came across, thanks for your service, great purchase overall!!! The wrist watch is even more beautiful than the the picture online and the packaging was superb. I am happy with my order and have no regrets for now. Purchased for brothers 30th birthday - best quality for best price / budget I was working too. Absolutely inlove with my watch :-D watchshop have amazing watches and deals! 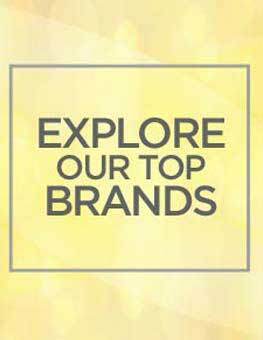 I have recommended watchshop to all of my friends family. I have gotten alot of complements about my watch and where I got it from. 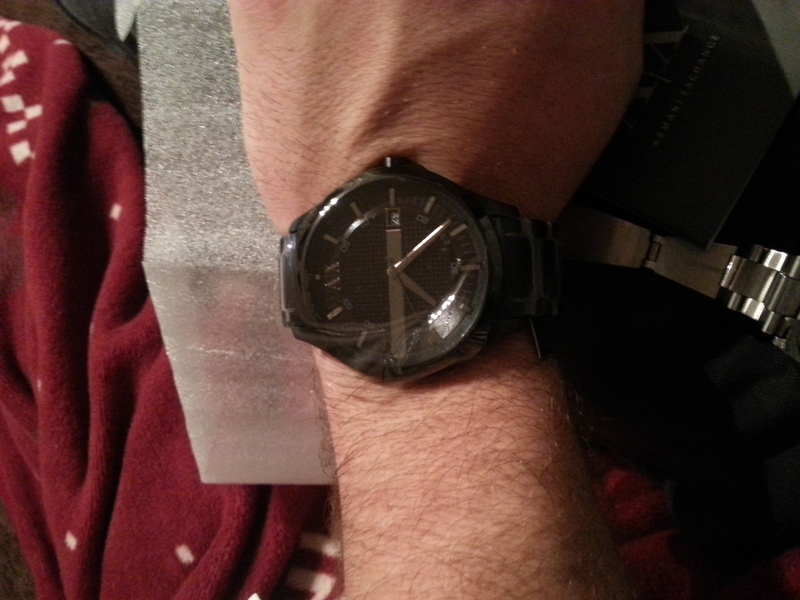 I bought the all black armani Hampton watch, the design is pretty simple but the style it lends to my outfit is exquisite. 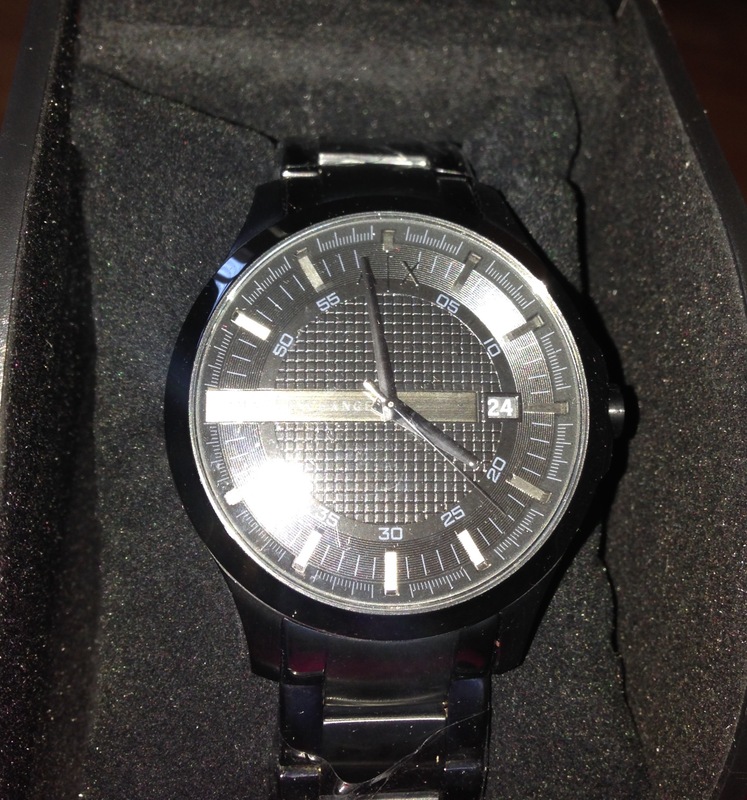 Delivery was super fast, watch looked even better in real life...bought for an anniversary and he loved it! Really nice solid quality watch . Easy to remove links for perfect fit . Got it my husband as a birthday gift and he really likes it . The product was accurate compared to the image, is style, colour and size. It was value for money being in the sale as I thought the previous price which was £150 was too expensive for the watch itself, but the cheapest compared to other businesses selling the same product. The watch is sleek and looks brilliant on, completes an outfit, and although would be worn as smart wear, compliments a casual outfit. The watch has a smart and sophisticated design. It is not all black so dont be led by the picture but it is a very nice, classy watch. Well worth the money. Stunning watch, picture doesnt do it enough justice. Looks more expensive than it cost. 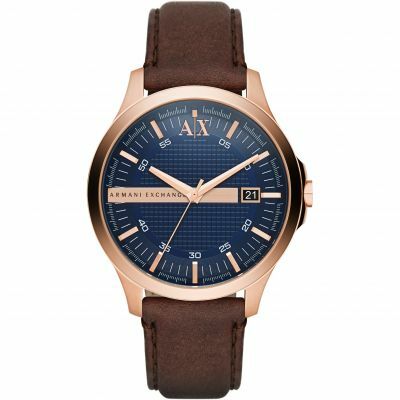 This watch is a Mens Armani Exchange Hampton Watch AX2104. I had told my son that he could pick what ever watch he wanted for his twenty first birthday present, and although I would have got him any watch he had chosen I was very pleased with his choice. He had been concerned that the face may appear too large on his slim wrist but it looks just right and the quality of the watch and bracelet are immediately apparent. It is waterproof up to 50 metres and the sapphire crystal glass will make sure there will be no problems with scratching/cracking. Personally I prefer the black version to the silver but that is just a matter of taste, the main thing is that my son is very pleased with his present and it will be with him for a long time pardon the pun as any watch should. The watch was purchased for my partner as a Christmas present, and after looking at the pictures online I was undecided on weather the choice was right or not. However when it arrived, It was definitly the right choice. The watch is stunning, looks lovely on and have been told its very comfy to wear. Its not too chunky or heavy and the black face is so sleek. Its looks so good. Some of the pictures I had seen gave it a silver effect almost but it is definitly all black. Worth the money. Excellent product, looks great casual or formal. Perfect working order and easy to use. Very sturdy and heavy and will definitely hop its value. All in all very happy and impressed with the product. Super fast delivery, fantastic price and watch. Thank you. Will definately purchase from watch shop again in future. Described accurately.quality product.packed really well and posted quickly.qas able to get a discount code on too of a great price. lovlry watch.need to get it adjusted and get a link taken off as purchased for a smaller wrist but easily done.looks really fashionable in black.have also had this in silver. 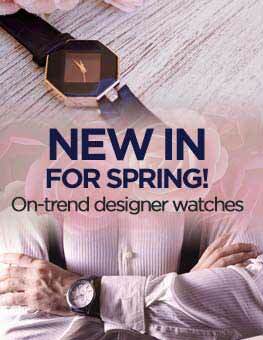 The watch has a nice big face, with detailed pattern inside which makes it look extremely stylish. The strap is good black metal only down point is its really heavy. Very nice watch. Stylish and comfortable. The watchoice is larger than it appears in the image but this was not a problem. The watch looks As awesome as it is online. Excellent choice for anyone going for a mature black chain watch. Good likeness to the picture. The watch has a solid, heavy and expensive feel to it. Brought this as a Xmas present for my boyfriend, I love it but will find out what he thinks in a few days. 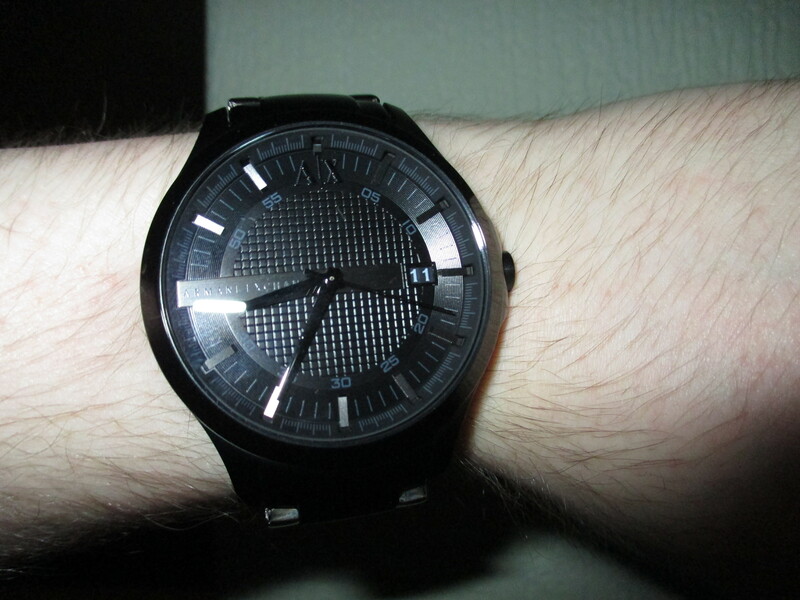 Armani Watch - Black face and Black strap, Really nice for casual outings or formal. Presented in box nice as a gift.Good value for money. The watch is really nice bought for myself, really stylish and goes with anything... Nothing bad. I got this watch as a present, Brilliant watch, very dressy and comfortable. Very pleased with the quality. Bought this item for sons 16th birthday, he loves it and is really pleased with the watch. Love this product. Worth the money!! Perfect watch to send as a gift. The matte black makes the watch look amazing! Love it. Would buy it if there was a female version of this too. I cant love this watch enough. The person I gifted this watch to loves this watch to. 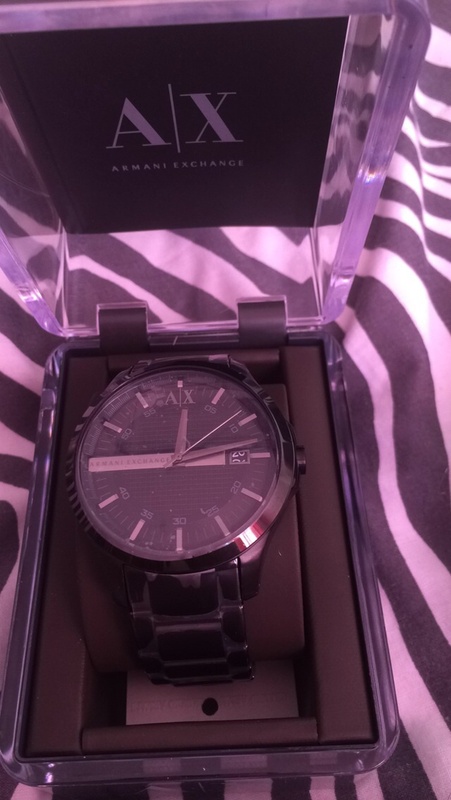 I purchased this watch for my boyfriend, I am more than happy with the watch as it is excellent quality the features include the date which is brilliant. I am so pleased with this purchase and my boyfriend will be made up when I give it too him. Really love the all black design, it was a gift for my boyfriends 22nd birthday and he loved it! The watch dial itself was nice and you could still see the hands etc even though its all black, would definitely recommend even the service was fantastic. Really nice watch, actually a lot nicer on than in the picture. my boyfriend was VERY excited to see i had bought him this gift for our anniversary. As shown on the bottom picture, the watch is all black but in certain lights top picture the tickers look grey, this was a great feature! The watch is very stylish and looks so much more expensive than it is, he has received loads of compliments already saying how much it stands out! The fitting of the watch was perfect and he will definitley be buying this style/model watch again when a new watch is needed. Overall a brilliant watch and a perfect gift. Beautiful watch, quite chunky with a big face, my brother loves it. I loved the dark finish and also black bracelet that makes it look even classier. Bought it as a gift for an 18 year old who is very stylish and this watch just completes the look perfectly, like a little cherry on top. Im definitely recommending it as a gift, its very sleek and tasteful. 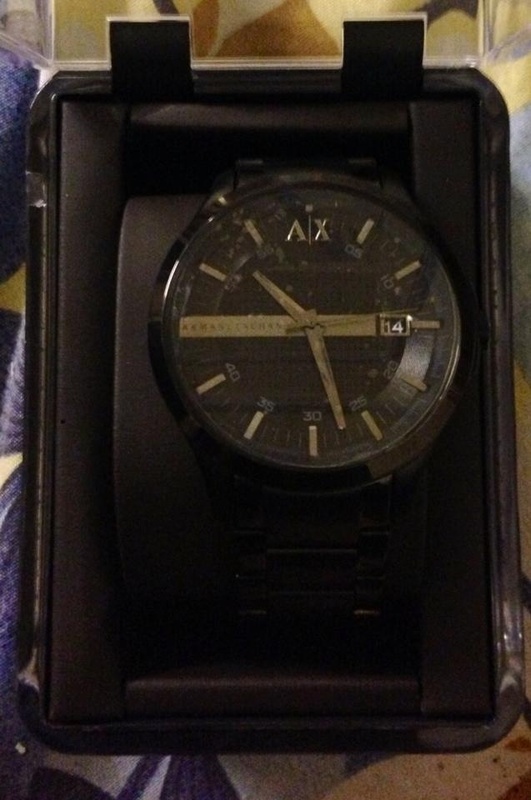 I recently purchased an Armani exchange watch which when it came my boyfriend absoliutley loved! It was a dark grey chrome black colour and very good value for money. Very expensive looking watch for a very good price and very sturdy strap and heavy face. Definatley worth every penny. This is a great watch, the quality can be seen and felt by the shine and weight of it. I would recommend as a gift. I have to say this watch is gorgeous, i bought this for a friend of mine am he absolutely loves it! It was definetly what i was looking for however i noticed the watch was scratched in a few places when i held it in the light but im not to sure if that happened when i got a link taken out however i am very pleased with it. The product is simply amazing. My girlfriend got me this for our Anniversary and I love it. The design is spectacular, Literally goes with nearly anything. Im usually sceptical of these watches watches because usually designer ones arent nice but this is! It is a watch for a bold,mature man. I love how it feels and the colour when i wear it. The watch face is a little bit too big. Purchased as an anniversary gift for my partner. He absolutely loves it! I think it is the perfect watch for a man who likes to look sophisticated & trendy. Love the two tone strap & the classy face. Highly recommend buying this one! I bought this watch for my partners birthday. The watch arrived quickly and was well packaged. I was extremely happy with the void sticker that came on the brown box showing absolute no tampering after packing. The watch is itself is beautiful and it looks fantastic on my partner slim wrist. The face, although may seem plain to some, is a simple but stylish, attractive design. The strap of the watch is slick and only compliments the body. The only issue I had with this is the size of the links. Taking two out meant it was a little too tight and when putting one back in, it was too loose - we had chosen to take two links out in the end. The watch stands out from a mile away and its absolutely stunning to look at. I am extremely happy with the watch despite the links issue. 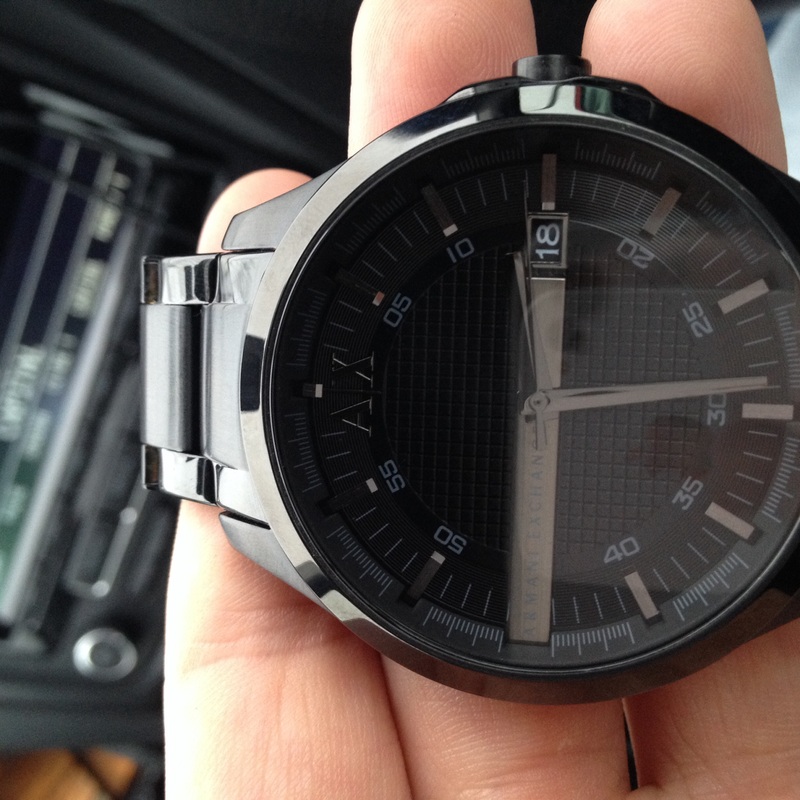 High quality black armani watch . Looks really classy. Brought for my husband and he absolutely loves it. He says its great to wear not too heavy but not too light. Fab watch for the price . Excellent watch,black, stylish,good value for money, made the perfect gift,just the right size for a well build male. The watch was absolutely beautiful, fantastic value for money & it came the next day which I thought brilliant as it was a surprise present, I will definitely be using the watch shop for future purchases. Such a nice fitting watching. Was concerned it wouldnt fit over my hand but fits lovely. Gorgeous to look at and I would recommend anyone getting this watch for casual/ smart wear. Only wore it a few times so far and had many compliments and questions. Shiny finish on the watch, grey/black surface. Beautiful big face, easy to tell the time on. Bought this for my nephews 18th and he loves it. Gorgeous watch, very trendy and a reasonable price. I bought this watch for my fiance as an anniversary present. He has fairly small wrists so i was slightly worried about the size of the watch but it doesnt look too big at all! Love the design of this watch and the fact that it is all black just makes it look very masculine and modern. The hands of the click and inner Armani band arent as black as they look in the picture shown, they look lighter in some lights but it is still a very nice watch. My fiance loved the watch and it looks very nice on. The fact that you can re-size the watch before you receive it made everything a lot simpler and avoided any extra costs. Overall an amazing watch that i would definitely recommend! The watch is amazing, I bought it as a gift and my friend loved it, it was the perfect gift, the colour was amazing and it looked better than it did in the picture on the website. Bought this as a birthday present and the watch didnt disappoint. Exactly as described. The detailing on the watch is perfect with the black and grey complementing each other. Excellent product and service. Watch came in 1 day and was well packaged. The watch itself is great and as described. I was worried after reading reviews that said it looked slightly cheap, but I was pleasantly surprised when I opened it! The colour and the quality is spot on, I could not fault it at all and I am very pleased with the price I paid for such a good watch! Couldnt fault the delivery either, plenty of packaging and fast delivery! Watch is huge, much bigger than any watch I have seen. Ive lost the packaging or I would have sent it back. I will not be wearing this watch. Excellent product, perfectly described, best price and a perfect gift for my son. This item was excellent quality. I bought it for my 18 year old son and he loved it. Watch has just come today came right on time just before 12 at 9! Which was great opened it to see it had been wrapped up looks lovely cant wait to see what he thinks of the present also watch shop kept me in contact with what was happening with the watch as I had requested a bracelet adjustment which was done and the link sent in a box definitely be using watch shop again, definitely a full 5 stars!! Excellent product, looks exactly like the pictures and a perfect fit. Normally Id have to remove one or two links from watches for my boyfriend but this watch fit perfectly. Very happy customer. I brought this watch for my boyfriend for his birthday. He never usually wears watches or any jewellery but is in love with this watch. The black metal looks really nice and stylish, goes with everything. Also looks much more expensive than it is and is a nice weight, not light which would make it have a cheap feel to it. Overall very happy with the purchase and was delivered next day! 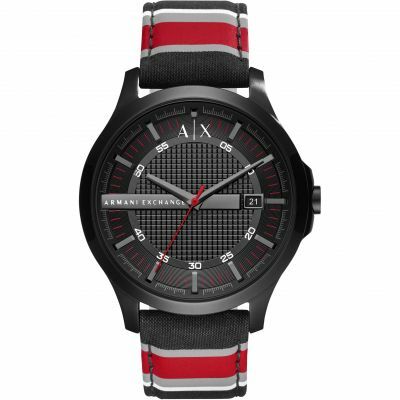 Would recommend for guys who like Armani and looking for a reasonable priced quality watch. Great product, looked even better than it did online and came very quickly. Also very impressed with the high standard of packaging. The watch itself was even shinier and light when it arrived. An excellent watch. A clear interface and sleek looking. I love the fact that it auto-updates the time each day. Simple but effective. Unfortunately the face is larger than anticipated, so I would probably not have purchased it in a shop. Also, the strap is a bit loose, so Im going to have to take it to a jewellers to remove a link or two. 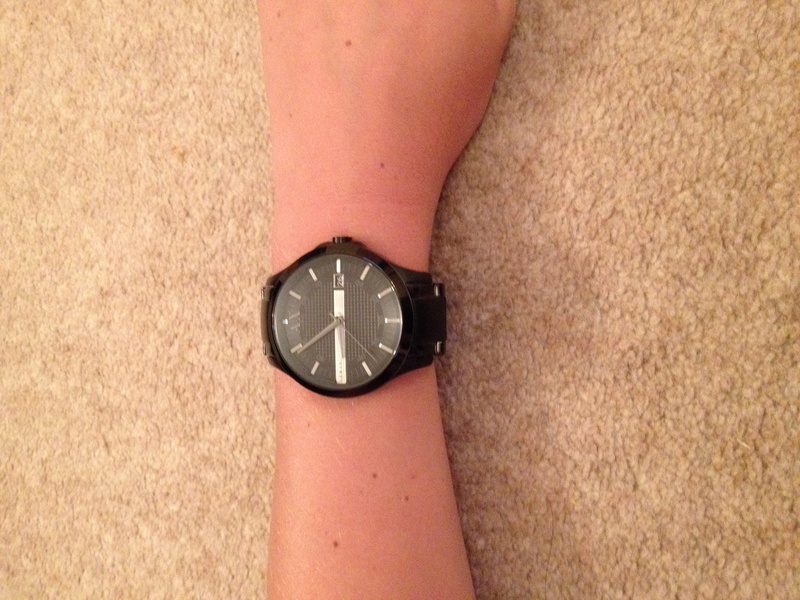 Despite the watching being very smart, from the picture on the website you are unable to tell how big the face of the watch is, which is quite large and looks quite silly on this average built 18 year old. Amazing quality! Affordable price. Looks 100x better in person as the pictures online make it look cheap. Love it! 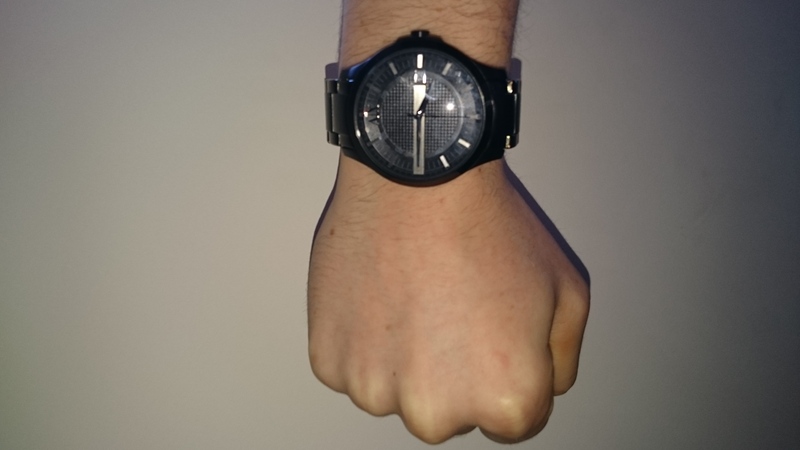 This product is very different to what it looks like in the picture, the actual watch is very nice and I was very happy with it, however the picture is very inaccurate ! The picture needs to be updated. The face is a lot larger and not all of the watch it black there are elements of silver and blue. Fantastic service no problems at all. Fast delivery and quality watch I would recommend the watch shop. The bracelet does look good being two tone black, however it is the only part of the watch that ‘feels’ cheap. When you take the watch on/off it feels like the watch bracelet is cheap, as it feels light and can make a slight squeaking metal on metal noise. Some of the black paint doesnt quite go over each individual link at the edges when you look close which is not what you would expect. I have checked closely and this cannot be seen when actually wearing the watch, but fussy people like me know its there. However, when you are wearing the watch you cannot tell that the bracelet feels cheap when taking it on/off. If you are looking for a classy, expensive looking, quality watch then this watch does deliver all of these things. You probably won’t find anyone else wearing a black on black watch which is exactly why you should seriously consider this watch as that creates the right kind of attention. Overall I am very happy with the watch and would recommend it to anyone who likes the nice quality things, but doesnt want to pay out for a more expensive watch. Yet. It has to be mentioned here as well that The Watchshop staff are really efficient, and I have no hesitation in using The Watchshop again as a result of this. The watch looks much better when you see it in real like because online the pictures of this watch wasnt really good but Im really happy with this watch. The watch is a gift so they havent seen it yet but i think its very good quality a bargain watch to buy the colour is very nice and so is the dial set out. Very nice and sleek look to the watch. Looks a lot better in person that in the photos provided. Very easy and clear to read the time and over all quite a nice watch. the item looks amazing, so much better than on website. it is black and suitable for casual and smart wear. Quality purchase, great value for money. 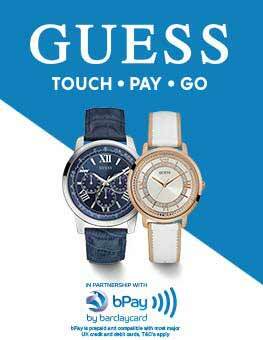 Watch shop is a reliable website, with quick delivery. This watch was for my Son who is 17. It is perfect for him, stylish matt black metal strap with a bit of weight to it and a nice face. He loves it. Good quality. The product itself is so good, the color of watch is black which is same as the picture on line. I like it so much! ..spare links got sent to me free of charge. Great customer service guys...thank you!! Its all stainless steel and looks fantastic! Its a big watch though so if you have thin wrists then I suggest not buying it. Ordered on a Friday night, arrived Monday morning! And my brother loves it. Very good service. Would use again. The product is very good quality, looks better in person and had completed my expectations of an armani product. The watch arrived on time and in very good condition, I am very pleased that I used watch shop and will most likely use it again in the future. Great service from Watchshop - The item was initially out of stock due to high demand but watchshop texted me as soon as it was back in stock. Once paid I had paid for item, it was dispatch on a next day service, just in time for Christmas - an excellent present. 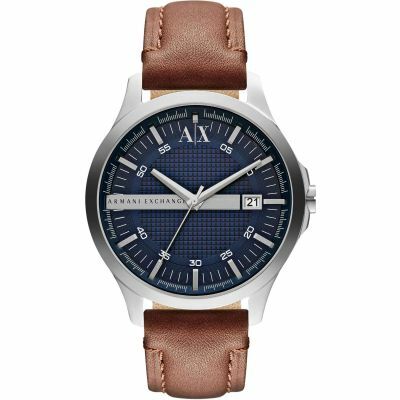 i have bought this armani exchange watch for my 18 year old son as a christmas present.he is absolutely delighted with it.it is very stylish and quite understated as it is not bling bling but gives the impression of a more expensive watch. the styling and finish are excellent. the dial is quite large but this seems to be the style at the moment and is probably suited more to a younger chap like my son. Face of the watch is a lot bigger than the picture if you have small wrists or arm I would not recommend. 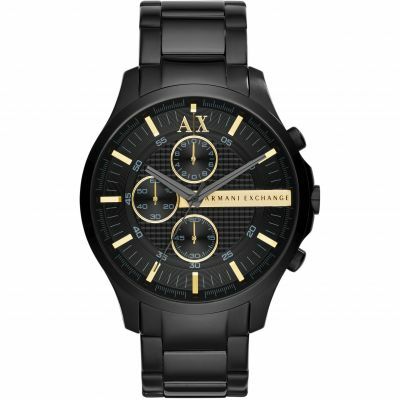 Armani Exhange watch, black watch face and metal strap, exactly what I was looking for. I bought this watch as a gift and was not disappointed when it arrived. It is light yet durable, smart yet casual, it met all the criteria I was looking for. I would definitely recommend this watch for both value and quality. The product was lovely, at receiving it I was a little worried as I havent viewed the item in person. I really like the bracelet of the item its nice and shiny. However one thing that can be improved is the main face of the watch. I feel it could look a lot better if it was thinner. All in all once it is on your wrist I think it looks very elegant and sophisticated mainly because of the colour of the watch. IT is black but has some essence of gunmetal grey. I love this watch. Its a really love size its not to big and seems to be just the right size for my partner. 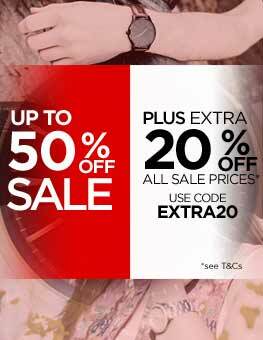 I am buying the watch as its a Christmas present, I think its a fantastic price for the brand your getting. The colour of the watch is really nice and works well with the links as there like Matt colour. Its a beautiful watch and Im really happy with it. The watch was in superb condition. It was on its original packaging, protected from scratch. Great watch. Looks good with work suits or going out clothes. All black so looks classy but not flashy and too in your face. Product great!, good webpage enbaling a 360 view of purchase. very quick& efficient in respect of delivery. Very happy with watch and delivered in a day. The only slight isue was that the dial is silver where,as the advertisiment states black. However this still looks gd. This watch looks completely different from the pictures on the website. I was looking for a subtle all-black watch and this seemed to fit the bill. However, the hands and dials are in actual fact grey, not black! This changed the whole look if the watch and I will definitely be returning it. Amazing look, sleek and sophisticated, looks better than it does in the picture! Great watch - looks great and seams durable and not prone to scratching. It feels strong and made with quality in mind. Has a good weight to it and looks more expensive than than it costs! I brought this for my boyfriends 21st birthday, it was a fantastic hit as he really liked it. Its as very sleek, classy and trendy look. The watch shines lovely and many features are very attractive. I also got the watch engraved which superbly added that extra touch! The watch is a perfect size, the face is not too big but also not too small and girly. 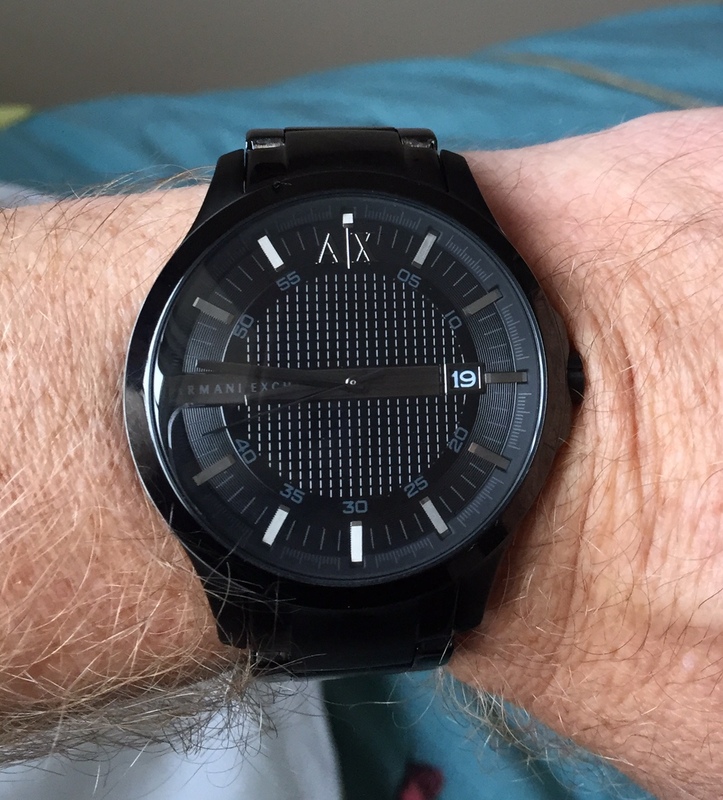 I think it is one of the best AX watches for a younger male, is not too plain but also not too busy. The numbers and hands look really nice and blend in lovely with the black strap and face. Overall I believe the watch is perfect for anyone looking for the ideal watch or present for a special younger man. Definately a must have and will be recommending to many! Finally, my boyfriend has recieved numerous comments regarding the sleekness of the watch and nobody would beleive the amaxing price! 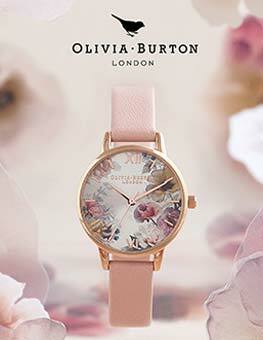 this watch is very stylish and looks more like it should be worth £1,490 no £149. we are delighted with it . Perfect, my boyfriend loved it : it is not as black as it seems it the picture, so I really enjoyed it. It is quite heavy for a not very expensive watch which is great! I love the fact that the bracelet is nt all shiny. I bought this as a gift for my brother and he absolutely loved it! He says its very comfortable to wear and can be worn everyday due to its simplicity. Definitely worth the money. Nice watch, good build quality and weight. Just at the limit of large face size, any bigger and could be silly. Nice Black-on-black styling looks classy. Ion-plated finish is sleek and sheer, time will tell of its longevity. Only has full bracelet links which reduces the options for size adjustment but other than that very happy with the purchase. Great Watch, nice design and really light. 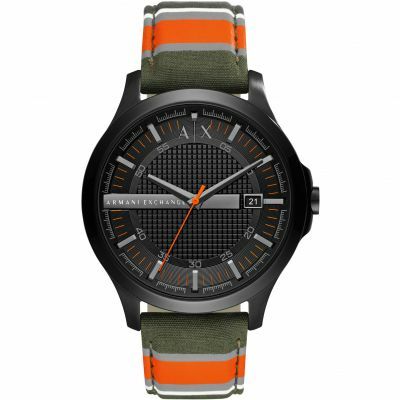 It is quite unique compared to other Armani watches. 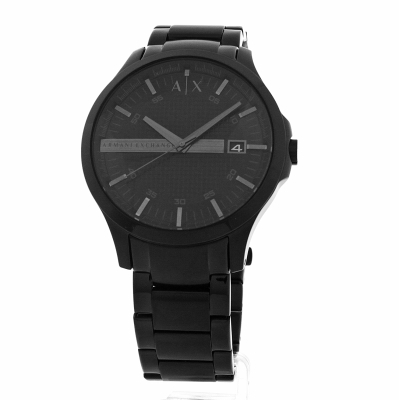 This sleek, elegant, matt black Armani Exchange watch is guaranteed to add a little James Bond to your style. Although it may seem too expensive at first, it matches every last penny with its quality, reliability, and, of course, its enticing appearance. The watch itself is made of faultless stainless steel, destined to endure years of use. Having said this, however, it is not heavy on the hand, nor is it uncomfortable – if anything, quite the opposite – the watch lays on the hand perfectly, and provides no uneasiness. The detailed watch face lives up to the watchs standards, really highlighting the matt black theme, and adding to the overall elegance. The touch of silver brings out the patterns on the watch face too. If you are looking for something which is built very solidly, but possesses the quality and looks of a classic Bentley, then this is the watch to go with. Whether its for a secret 007 mission, or a date with a lady, you wont be late for it. 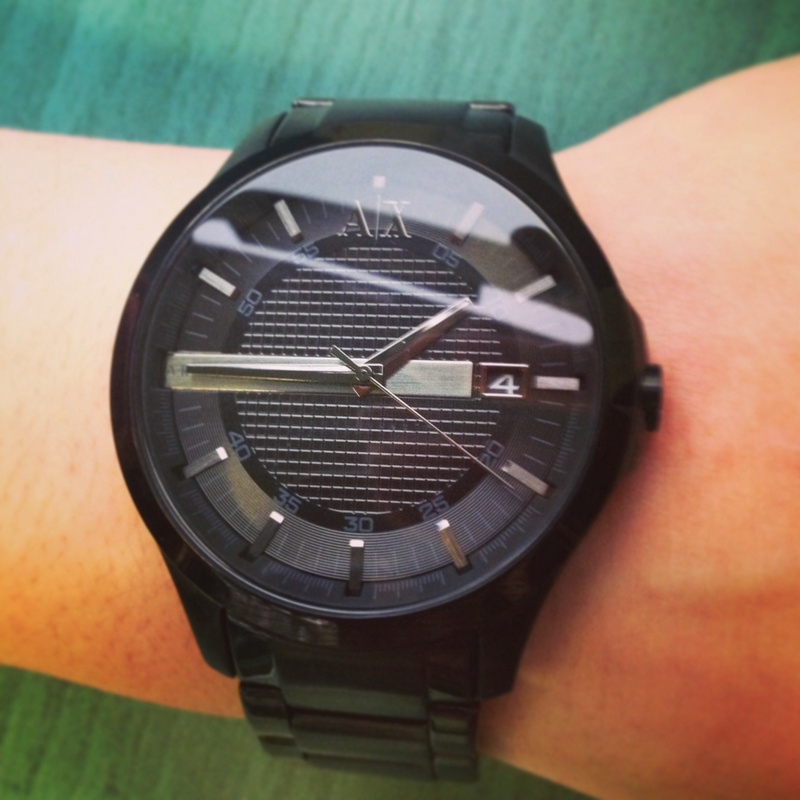 This sleek, elegant, matt black Armani watch is guaranteed to add a little James Bond to your style. Great speedy service.... good packaing, no damage to watch when received, would recommend, and good looking watch and fit. fantastic watch excellent purchase very sleek and beautiful watch well worth the money its got the look .thank you watchshop. Excellent look and feel for the price. Not too flashy, easy to read dial, nice comfortable bracelet. The watch looks really different from most on the market. Fantastic, beautiful watch. My boyfriend loved it. Its a real manly watch I am more than happy.